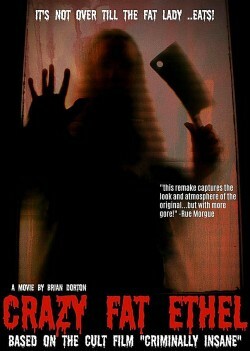 Your new movie Crazy Fat Ethel - in a few words, what is it about, and what can you tell us about your character in it? Basically it is about a woman named Ethel who will stop at nothing to get what she wants, which is to eat. No one will stand in her way. And I play Ethel. What did you draw upon to bring your character to life, and quite honestly, how much Dixie Gers can we find in Ethel? And even more honestly, how much fun was it to play her? I went back and watched the original, Criminally Insane, quite a few times. I really wanted to capture what Priscilla Alden brought to Ethel�s character. She was so good at what she did. I also looked to Kathy Bates� character Annie Wilkes in Misery. 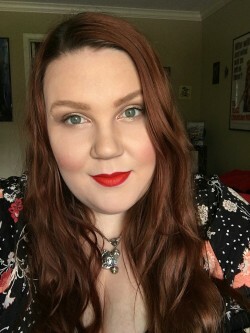 Being a plus sized female, I�ve been in situations where people call you names and such. So it was easy to relate to Ethel in that way and build the rage one would have from it. It was an absolute blast to play Ethel. I could kill people all day! 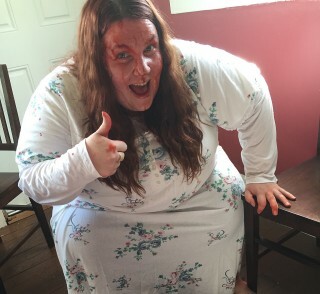 Crazy Fat Ethel is of course based on the 1975 movie Criminally Insane - have you at all seen that movie before shooting Crazy Fat Ethel, and your thoughts on it? I did see the film before shooting. And it�s just a great little gem. Priscilla was simply amazing in it. A fun film to watch for sure. And awesome to see a plus sized female character as a lead character (and killer). I actually met the director, Brian Dorton, at a horror convention from a mutual friend. I was a vendor and they stopped by my table. A Facebook add and a few weeks later, I was told about the film and auditioned. I even went as far as to take a photo of myself as Ethel that I sent to Brian and Doug. Bloody meat cleaver and all. And the rest is history. What can you tell us about your director Brian Dorton [Brian Dorton interview - click here], and what was your collaboration like? Brian has such a creative mind. He has a vision and he knows what he wants. But the cool thing is, Brian also gives you the freedom to get creative too. It was great working with Brian. He always listened to my opinion and valued any input I had. And always made sure I was comfortable and taken care of. And I actually came on as a producer and helped with some of the special effects as well. I loved working with him so much that we have started working on other projects together too. We started filming in June, and it was set in a house that basically had no air conditioning. It had one window unit but you could only feel it if you were standing right in front of it. Candles would melt on their own from the heat. We used real pig guts, so I think the heat amplified their smell. One cast member got sick from it. I didn�t mind them though. Overall, we became a big family. We would shoot a death scene and get blood all over us, and then go out to eat after still covered in blood. Lots of laughs were had. You can see some of the behind the scenes currently on YouTube in a featurette we uploaded from a filming day. One of the cast members and I ended up dating from meeting through this film. Currently finishing up a script for a film called Venom Of God that we will be filming later this year. It will be directed by Fritz (who plays Drake in Crazy Fat Ethel). Brian and Doug are on board to help with this project too for reel EPIC entertainment. I did a lot of plays in middle school and high school. Never had any formal training. But I�ve always wanted to play a killer. 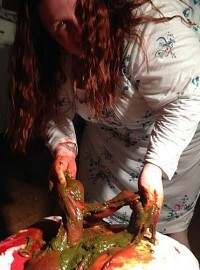 What can you tell us about your filmwork prior to Crazy Fat Ethel? I had a small role in the film Preexisting Conditions. And have done a few small promos for some people. Crazy Fat Ethel has been my first major role. Dedicated to the film and the role. Passionate I guess you could say. I care about the details and getting the shot probably just as much as the director. I try to relate to whatever character I am and envision how they should be and where they are coming from. And build on that from there. Kathy Bates, Cassandra Peterson, and Fairuza Balk. I also get super inspired by people like Adam Green and the Soska Sisters [Soska Sisters interview - click here] who are out there doing things themselves, on their own terms. Nightmare On Elm Street 3, Slither, The Strangers, Texas Chainsaw Massacre (original), The Labyrinth, Trick R Treat, Evil Dead, The Lost Boys, Hairspray (original), Cry Baby, so many more! I�m actually not a fan of any of the Paranormal Activity films.